1660s – Hyperbaric oxygen therapy dates back to 1662. Nathaniel Henshaw, a British physician, discovered that you could use compressed air in a chamber to achieve an HBO2 environment. Around this same time, Boyle’s Law was also originated. This law states that the pressure of a given mass and its volume have an inverse relationship at a constant temperature. 1860s – Neurologist James Leonard Corning built the first hyperbaric chamber in the U.S. to help treat Hudson Tunnel site workers who were experiencing decompression illness. 1910s – Scuba accident? Benhard and Heinrich Dräger have a solution. In 1917, these two German inventors discovered that you could treat decompression illness from diving accidents with pressurized oxygen. 1920s – Orval J. Cunningham built the largest HBO2 chamber, the Cunningham Sanitarium to treat a variety of illnesses, including diabetes and cancer. Albert Behnke and Louis Shaw built on Cunningham’s discoveries and used oxygen instead of compressed air to treat decompression illness. This led to the first nitrogen-oxygen hyperbaric treatments. 1950s & 60s – The benefits of HBO2 beyond decompression illness were discovered. During the 1950s, Ite Boerema discovered HBO2 was helpful as an aid during cardiopulmonary surgery and by the 1960s it was used to treat a wide range of medical conditions, such as anaerobic infections, carbon monoxide poisoning, wounds, trauma, and more. 1970s – The Hyperbaric Oxygen Committee was developed to ensure the ethical practice of hyperbaric medicine. Today – Hyperbaric oxygen therapy is used to enhance the body’s natural ability to heal. 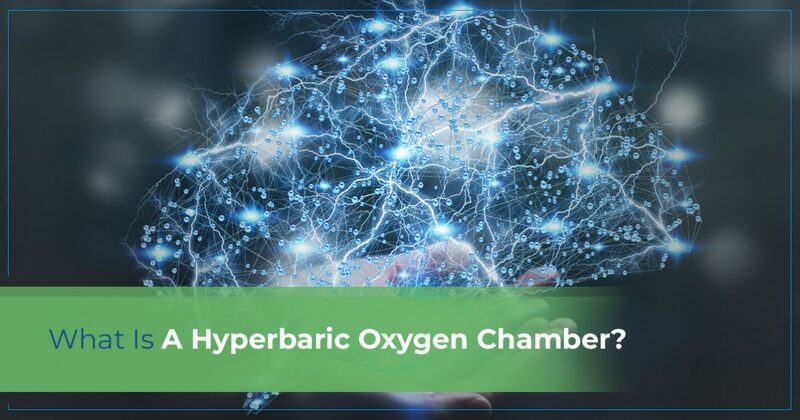 Hyperbaric oxygen chambers are used to treat a wide variety of medical conditions, such as severe anemia, burns, decompression sickness, carbon monoxide poisoning, sudden deafness and vision loss, infections, and more. A hyperbaric oxygen chamber increases the air pressure three times higher than normal. This increases the amount of oxygen that is carried throughout your body which helps your body fight bacteria, heal tissue, detoxify, release stem cells, and more to fight infection and promote healing. A hyperbaric oxygen chamber is a tube-shaped chamber (similar to an oversized-duffle bag) that features a canvas exterior. When you show up for your appointment at NeuraPerformance in Denver, you will be asked to step inside the hyperbaric oxygen chamber. Once you are comfortable, we will zip the chamber closed, and pressurization will begin. Treatment will last about an hour and at the end of your session, the chamber will depressurize gradually. You may read or listen to music during your session. During your session, you may notice a change in pressure in your ears, similar to what you feel when landing in an airplane. Hyperbaric oxygen therapy can help with a variety of medical conditions, but can also be used by healthy individuals who are seeking performance gains or optimal brain health. If you are interested in experiencing a hyperbaric oxygen chamber session, schedule a consultation at NeuraPerformance in Denver today. We look forward to speaking with you!